School nurses are registered nurses (RNs) who work in educational institutions of all levels from elementary schools to colleges. They specialize in caring for children and young adults in an educational environment with the goal of advancing the students’ well-being , their academic success, and their life-long health and achievement. School nursing has existed in the United States since Lina Rogers was hired by the New York City school system on October 1, 1902. She was hired to help prevent absenteeism by reducing the occurrences of communicable diseases through intervention with students and their families. Because of her successes, the role of school nurses has continued to expand since then. 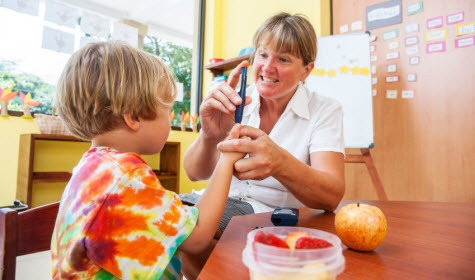 School nurses serve as the health care expert within their respective school. Through their knowledge and understanding of normal growth and development of children (even those with special needs), they work to help facilitate such normal development of their students and to insure positive responses to plans for student care which they develop using the nursing process of assessment, intervention, identification of outcomes, and evaluation of care. They promote health and safety in all areas of the educational environment in which they work. They provide health education to students and other staff members. They act as consultants to other school personnel such as food services employees, coaches, physical education instructors, and guidance counselors. School nurses insure student immunizations are current, assess the educational institution to identify safety hazards. School nurses are responsible for providing health care during school hours to those students with chronic or acute illnesses as well as to those with injuries. They perform a variety of tasks to that end including administering medication. They may perform various screenings for things like vision, hearing, body mass index, and more. Under the Individuals with Disabilities Education Act (IDEA), school districts must provide nursing services for students needing nursing care. This means not only are they responsible for providing assessments for students in special education programs, but they must also deliver nursing services to students who require a variety of medical procedures such as tube feeding, catheter cleaning, injections, and more. These are just some of the important roles of school nurses. Obviously, this nursing specialization’s name pretty much says it all. School nurses tend to “work in schools”. However, in addition to being employed by public school systems, private schools, parochial schools, charter schools, and universities, they are often hired by health departments and hospitals. Requirements for becoming a school nurse may differ from state to state. Of course, school nurses are required to be professional registered nurses. However, the National Association of School Nurses recommends that those seeking to be a school nurse also hold a Bachelor’s degree in nursing and be certified. Nurses who pass the credentialing exam offered by the National Board for Certification of School Nurses can earn the credential NCSN which stands for National Certified School Nurse. Other state-level school nurse certifications are offered in some states.